The red, white and blue color scheme was selected because these colors are representative for both flags of the United States and Thailand. The red symbolizes strength, the blue --loyalty and unity, while the white symbolizes peace. The nine stars represent the AFTN airmen that made the ultimate sacrifice giving their lives in service for their country for whom the VFW post was named. In addition to being a symbol of the protector and truth, the stars also represents that divine spark of freedom that shines in each of us. Commemorative painting presented to the USAF Museum of Art at the Pentagon in l971 to honor the nine men who were killed at AFTN Udorn. 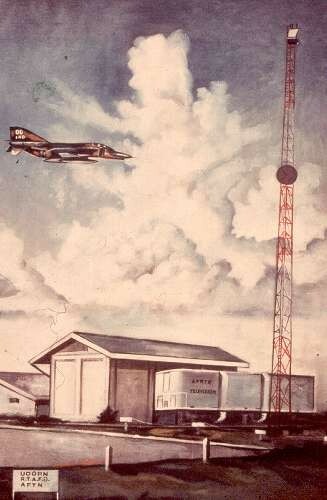 The painting by Chantiapkony replicates the station with an F-4 overhead. It had been 35 years ago on 10 April l970 that we lost nine great guys. The traveling war memorial made it here in Payson, AZ a couple of years ago, and I took my daughter (who is now in the Air Force) and my Thai wife (Bua) (31 years of marriage) to see the memorial and the names etched on it. .....those AFTN personnel not working at 2:05:30 all had strange stories to tell... engineer Don Freas at the hoppy shop, Stn Mgr Jack (John)) Lynch reporting to the base clinic. Ray Hackett going to pick up our mail, and I'll never forget Larry Sawell coming down the road trying to find the station on his handheld AM radio (he monitored and critiqued us) as the station was on fire and smoking and the look on his face as he approached what used to be AFTN-Udorn. I made my annual pilgrimage to the Vietnam Memorial today to honor our nine AFTN brothers who died in the line of duty on April 10, 1970. It was a beautiful sunny Sunday in Washington with the annual Cherry Blossom Festival having just concluded Saturday. The blossoms were in full force so there was major gridlock in DC and the Mall was crowded. The new World War II memorial was packed with families enjoying the day. The Washington Monument grounds had been stripped down to the dirt, no doubt to excavate for all of the wine bottles left over from the 4th of July. At the Vietnam Memorial the crowd was fairly sparse. There was a young Thai woman in traditional dress near the Memorial that made the visit particularly poignant. 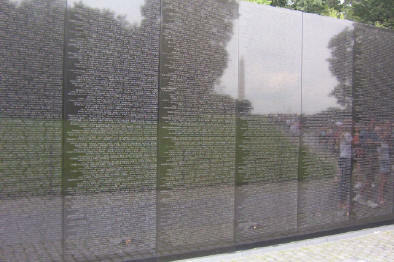 Vietnam Vets were helping visitors locate the names of lived ones. On either side of the 12-West panel where our friends are enshrined, Vietnam veterans and family members were making rubbings of the names of those they want to remember. Wreaths, pictures, and teddy bears lined the base of the Memorial. On the way home, I stopped by the bar of the old Willard Hotel and toasted these dear friends, lost to us 35 years ago today. Perhaps next year some of us can meet at the Memorial and together reflect on the fond memories we have of the Udorn nine. I used the Metro to get into Washington. All the while, the vision of the bombed Madrid trains danced in my head. I didn't see a single security guard during the trip. I kept looking for discarded knapsacks under the seats. I was relieved when I exited above ground at the Smithsonian stop. What a way to live. The Mall was crowded with tourists, mostly young couples with children. Young people were playing soccer on the grass. The WWII Memorial is almost finished. It was the last day of the Cherry Blossom festival and it was quite a hike to the Vietnam Memorial. While searching for 12 West panel, I saw a veteran festooned with red, white and blue suspenders. He was about my age and overweight like me. He had a ladder and was helping people climb to the top of some of the panels to take a rubbing of the name of a loved one. At other times he was helping the visitors locate a name. I finally made my way to 12 West. There they were, at about knee level: Hawley, Howard, McCartney, Potter, Rose, Ryan, Strain, Walker, and Waterman. I thought, "Thirty-four years is a long time, but I remember the tragedy like it was yesterday." I'll never forget it. Nor will I forget the courage and dedication of the survivors and others who got us quickly back on the air at Udorn. As I looked around the crowd, I wondered how many of these people, most younger than me, had any idea of the sacrifices made by the men whose names were recorded on the wall. I had the urge to contact the relatives of our nine friends who perished and tell them what these guys meant to us, and to the troops they served in Thailand. It was an emotional, moving experience that all of us should undertake. I will be here every April 10th to think, reflect and somehow connect with these guys. As I was leaving, I heard someone say, "I wonder where they are going to put the Iraq Wall? Let's hope and pray that it isn't multiple panels. Today marks 33 years since the crash at Udorn. I could not let the day pass, without memorializing it here. I'll be in Washington, Sunday, and, as in previous years, will pay my respects to The Fallen Nine:Panel 12 West, line 120. I HAD A PHONE CALL THE OTHER DAY. . .
Just a friend, with time to spare, to while away. Another voice, badly shaken, comes in to stutter . . . The word’s the station…the van…it all went…! One of the birds…an RF-4…” Through sobs, a mutter. The Hours, the count, the toll…rising yet. These voices stilled…the men quiet, the silence is all. “you’re sure, sir? There’s no doubt? “The Voice of information…and Entertainment”. The tragedy of nine men…wrapped in one small comment. A small building, a radio building, and some barracks. “They belonged to AFTN? What’s that? These records, this history…IT won’t say, mac”. Nine men, nine faceless names, nothing more, nothing other. Only a man…now emptiness… he’s “gone away”. I thought I was going to die in a crash that occurred in a ........... building directly across the street from where the RF-4C came to rest in the AFTN building........... Whenever we got mail in, on any day of the week we would tell the guys over in AFTN and they would announce it to all the mail guys in the units there so mail could be delivered immediately. The AFTN guys gave there lives to a very important cause, the well-being and happiness of many of us who were on the other side of the world from our families. I'll never forget them. "Tom Waterman, whom I was stationed with at Sheppard, ......was really a nice guy, who left (at that time) a wife and a baby, who wasn't more than a few months old...."
"....I knew every man stationed at the Udorn AFTN site. I knew Tom Waterman. .......I remember working into the dark that night and I was crying a lot because being in AFRTS/AFTN...., we were not just G.I.s, but brothers in uniform and a lot of my brothers died that day....."
I still recall the events of that fateful day, ..... I can vividly recall the good times Ed and I had at the Ft. Harrison NCO Club, common trial and tribulations with our class studies, plus the trek he took me on of the Udorn bars and joints when I as there TDY. "